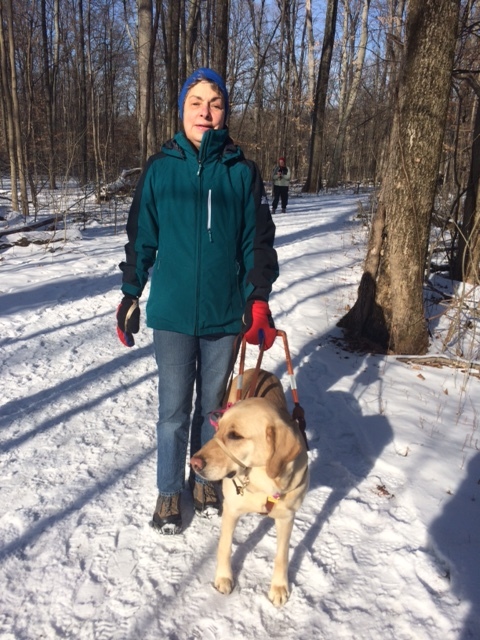 One year ago today, I met a sweet lab/golden cross named Dora, at the Seeing Eye in Morristown, NJ. I had arrived with the other students in my class the day before, and that Wednesday was what they called “Dog Day,” the day we would meet our partners for independence and dignity. She would be my Seeing Eye ® dog for the next 8 or 10 years. The summer before, I had been paired with a magnificant male golden retriever, but he proved not to be a good match for me. He refused to walk at a brisk pace, and he ran me into things. He just didn’t want to work for me. So, I returned to The Seeing Eye for the February class to try again. That first morning, there was so much snow and ice that all we could do was walk down the long driveway at the school, as all the streets in Morristown were impassible. Bundled up with coat, hat, boots, and gloves, I took up the harness, and woe! I had to hang on for dear life to keep up with her. I kept thinking, “Be careful of what you ask for.” I wanted a more energetic dog, and boy, did they ever give me one. In fact, I worried that maybe I was too old to handle such a young and athletic dog. Her pull was way too hard for me, but I wanted this relationship to work so much, that I hung in there, and together, we learned what to expect from each other. The first day we ventured into Morristown, the streetes were covered with ice, and the crosswalks were bordered with mountains of snow. The sidewalks had been cleared just wide enough for a dog and a person to carefully navigate. We hadn’t been out for 30 seconds, when I fell over a snowbank to my right. Dora had to learn to give me a little more clearance on the right. And she did. She learned to slow way down when we came to a patch of ice, and to find the narrow path somebody had carved out of the snowbanks at the corners. There were so many challenges in just walking down the street and remaing verticle that I don’t even remember being cold, except when it was park time, the time we took the dogs out to relieve. There was a blizzard one day during class, so we did not go out to practice at all that day, and each time it was park time, we had to wait for the snowplows to finish clearing the area, just minutes before we brought the dogs out. We must have gotten another foot of snow that day. When I brought Dora home after our 17 days of training, there was snow on the ground here too. It would be weeks before the curbcuts and corners would not be clogged with snow. I worried that Dora would not recognize them as curbs, once the snow had melted, but she is a champ. To celebrate our anniversary today, we walked to the coffe shop, about a 3—1/2 mile round trip, negotiating icy patches and piles of snow on the corners, just like exactly one year ago today. As I write this, Dora is happily chewing on her anniversary present, a huge nylabone. We have our routine for the day, which always includes a ball-playing session and a good walk. I think we’re both pretty lucky. Aww such a sweet rememberance of when you first started with Dora…it’s nice to take a moment to realize how far you have come as a team! It takes hard work to settle in with each other. Congratulations on your first anniversary together! A match made in Heaven…both are bright, confident, inspirational and strong.